We've all grown fat over the last few days, so it's back to work to get some excercise. 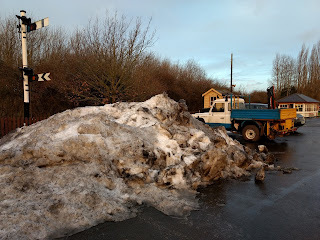 The Landie was trying to hide from us behind this pile of snow. It has an iffy clutch, so we left it to one side and loaded the drill that we needed into the boot of Mike's car. Well, Skoda also built steam locos, didn't they? 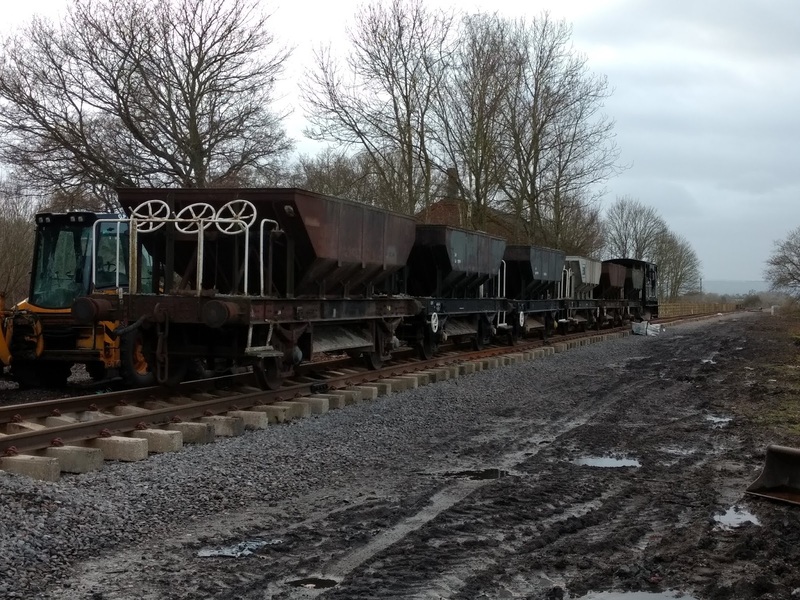 A plan to remove some temporary fish plates in readiness for the imminent welders failed when we found this empty ballast train parked on top of the piece of track in question. Drat. On top of that there was a report of a broken set of fish plates at Southam, so Nigel and Bert Ferrule went there first to effect an urgent replacement. Trains were still running today. The rest of us (11 in total) repaired to Broadway north to install a set of check rails on the through line turnout there. 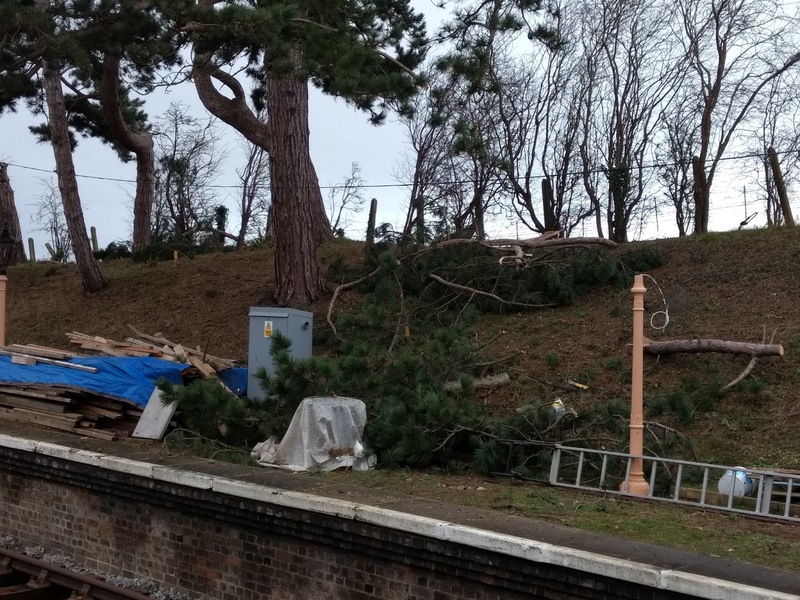 The snow that we had in this part of Worcestershire has not been kind to the GWR pine trees. The snow was wet and particularly heavy. Numerous large branches were snapped off, and one took out the Webcam as well. However, it's an ill wind that blows no one any good - a Broadway volunteer was quick to load some of them into the back of his car for firewood. 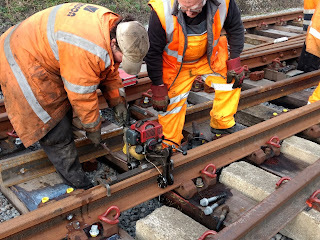 Back at the northern turnouts, heads were scratched at length over the exact position of the check rails. 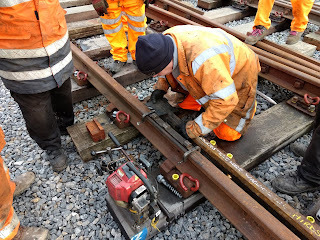 We spent the time during Nigel's absence fruitfully by unloading the two heavy rails off the trolley with which they had been moved through the site, and heaving them roughly into position. With the return of the head of department from Southam, repairs effected, the situation became immediately clearer and we could start drilling. The check rail here has been moved back into the four foot for the duration. We were most careful to measure twice (drill once) so that the holes we drilled agreed with those already in the check rail. This was fresh from the factory, and still had our name on it. Then the chunky spacer blocks were slipped in from one end, and the long bolts that hold everything together were pushed through. The holes matched perfectly - result! We still need to source some of the square blocks that go under the nuts at the other end. These, of course, are not on site but way back in Winchcombe. That's for another day then. Finally the check rail here was tied down with Pandrol clips, in this photograph with the nicely coloured blue ones, which signify that they are reverse ones. Chris with the puller had a distinct preference for the blue ones, as you can see. What was causing everyone to look to their right was not recorded. Perhaps someone said 'cake'? Lunch was held in the Broadway cabin, which offered warmth, tea, and a slice of Mrs. B's sponge cake. Sadly, no inch thick marzipan icing, we'll have to wait another 12 months now. 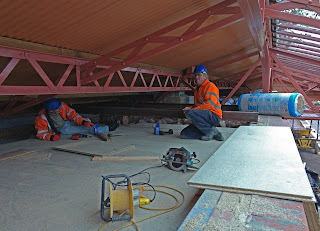 Due to the repair required to the webcam, the footbridge was accessible today - an opportunity to show you what things look like from above now. This is the view towards Honeybourne. The trolley loaded with tools is being pushed through the site. Naturally the handle to release the brake was a long walk away at the opposite end, but we did come here for some post Christmas excercise, didn't we? 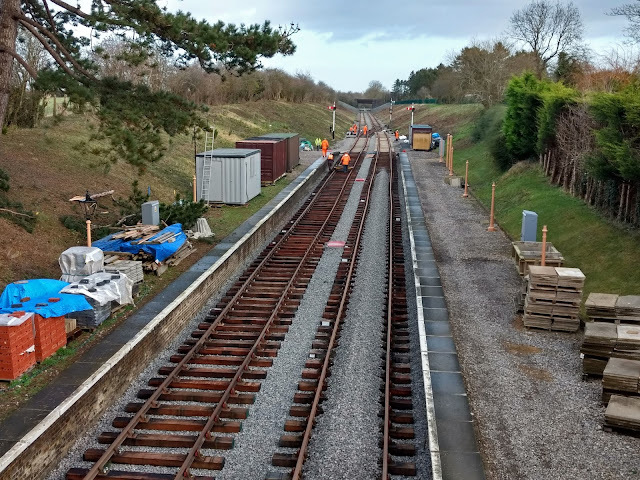 Looking south, the newly laid track is already looking more permanent. It's already had two trains over it, the second discharging 5 Dogfish of ballast. The mini digger in the centre was used to carefully spread the modest amount dropped. We really don't want to have too much in there. You can always add another wagon load, but you can't take one away if it's too much. Some have commented that the Broadway gang must be working until late into the evening, as they could see lights on in the building. This is not entirely correct, the lights you can see at night are infra read heaters used to dry out the rooms after the work to the walls and floor recently. The tilers for both will be with us in a fortnight or so. Quite exciting really. They picked the uncomfortable job of covering the ceiling of the rooms, and the thick insulation on top of it, with fibre sheets. Supplies of both sheets and insulation can be seen on the right. They worked on their hands and knees, sometimes stretched out on their stomach as the roof space is very low at the rear. In the times of the original station building this space was used by one Broadway employee to hide things that he didn't want the stationmaster to see. Two of the gang split off to bolt on a stretcher bar to the turnout at the end of the through road. 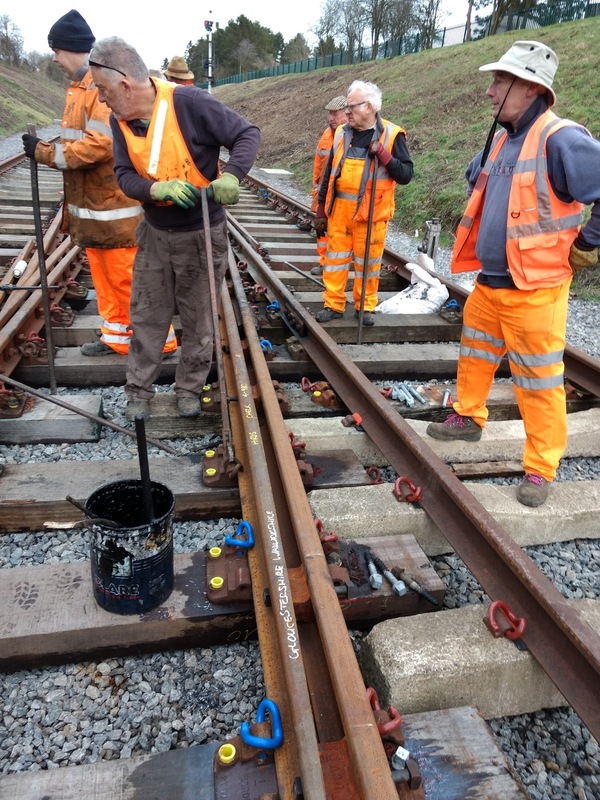 Another one of the multiple fettling jobs that will be needed to get this stretch of track up to fully useable condition. 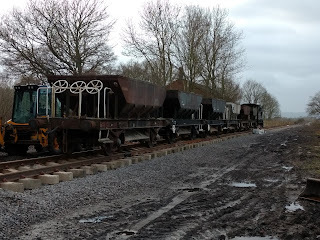 Smallish gangs should be able to do these; the main gang has its winter job at Toddington now. We need to seize our chance while the trains are not running - but not yet today. With both check rails drilled an bolted own, as well as two broken base plates replaced by two brand new examples, we called it a day. The light fails quickly this time of the year - today must have been just about the shortest day we had in 2017. This end of the day shot shows the gang loading the tools back on to the trolley. 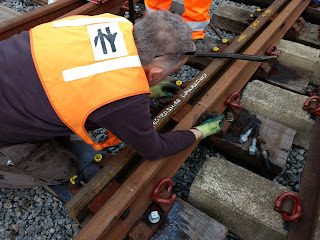 The two check rails we put on are left and right of where the gang is standing. All the rail through the station is now in, and indeed you can see a train in the distance. Just like a normal station in fact. Good to see you all back after (hopefully) a great Christmas time celebration. you mentioned finding a spotty faced kid to help you understand the workings of your camera phone. - I needed one to help me understand my new printer. (I think it can fly the Enterprise!!). Wonderful photos off the footbridge, - and check rails put in too! Well done P Way gang! I thought that the lights at Broadway were something along the lines (no pun intended) of some form of heating, especially when I noticed the doors propped in position - and the light was RED! - that is a heater, no doubt about it! Regards, Paul. Thank you for more wonderful pictures. I wasn't sure what the weather was doing in the vale of Evesham, but the snow seems to have melted in Broadway. I particularly liked your final photo. I don't think I've seen a view of the station quite from this angle. It really shows the slight curve in the line (which I know, makes everything more difficult). In addition to all your other work on the line, I think the PW team are doing brilliantly (as always). Many thanks for the post. And don't give up completely on your celebrations yet. There's still New Year to come ! Thanks for the update, Jo. 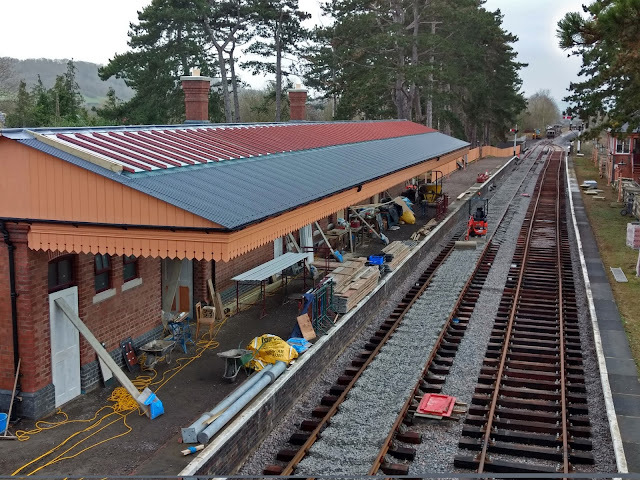 Nice to see the pictures from the footbridge - which prompts me to ask: has any solution been decided on the footbridge stairs and the canopy extension? I understand an acceptable and believable layout has been agreed. However, it will be built in a new budget round, all current funds being committed to getting the station open. does anyone know what's happening ref the drive and station frontage being surfaced Tarmac ect..! Rest assured, it will be done soon, and at the appropriate time. Meanwhile , there's a great deal else to do. The priority is the reinstatement, after so much physical toil, of the railway line into Broadway, to the satisfaction of HMRI, as required by ORR. Oh dear, more officialdom, more scrutiny, more inspection, all in the name of "public safety". Well, yes, so be it. But all will be well. Wait and see !!.. Does anyone know when this station opens please, and can I get a regular connecting train to London. Thanks. Chuck. Broadway station is not connected to the main line railway, that is 4 1/2 miles further, a future project. Buses run every 20 mins from Cheltenham to Cheltenham Racecourse P&R & take about 20 mins plus the walk through to the station. Does Jo mind if I make my reply to Chuck ? I believe there will be more such questions, as knowledge of the GWSR grows. However, the fact is that no such connection between the GWSR and the national railway network yet exists. Oh, the route of the old railway is still there. Look on any map. But it will require time and money to re-open it. One day, hopefully, there will be such a connection, but this is at least several years away ! Yes, I too like the idea of a "through ticket" from London to, say, Broadway, Tooddington, Winchcombe, et al. but not, I think, in my lifetime ! 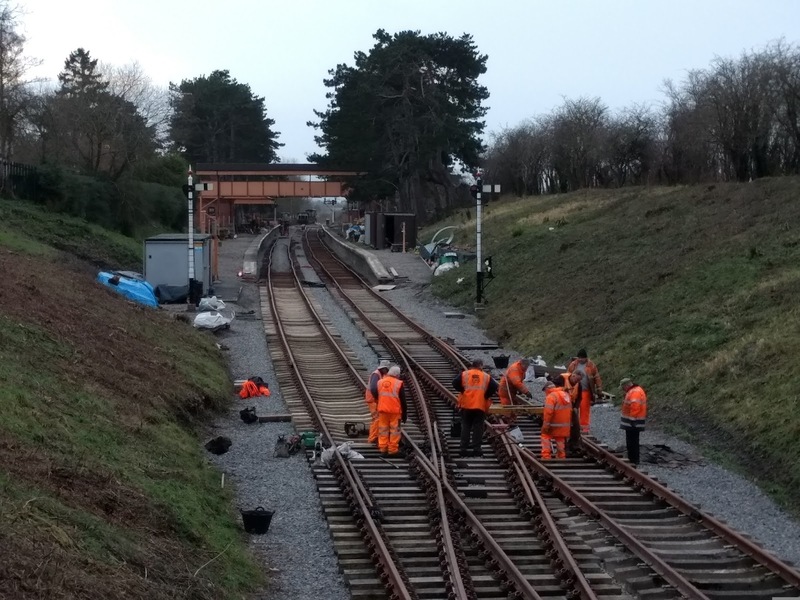 Nevertheless, I hope that Chuck, and many others, will be interested enough to visit the GWSR, and experience what the GWSR has achieved, what it has to offer, and what it can do in the future. And I wouldn't say so, if I didn't think so. Here, Between the Vale of Evesham and the Cotswolds, you will find the heart of the English countryside. And very lovely it is. Oh, and if you like old railways, that would help ! Don't take my word for it. Look it up on line !! Excellent progress!! 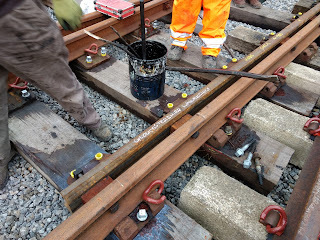 When the tamper comes to do the track in between the platforms, will the central drains be an issue? We'll have to see on the day. No problem with tamping around the drains. Tamping tools can be swung out of the way to clear obstacles such as s+t rodding, ducting etc. How much of the CWR track south of Childswickham Road bridge is now fully finished & ready. I remember the snow delayed things and there has been no reports since. It is ready up to +/- Pry lane bridge. 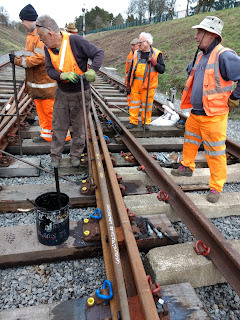 The welders are coming tomorrow to to alternate welds up to the Broadway southern turnout, then it's ballasting. Well Jo, an amazing result by the team, despite the bad weather you kept the promise that it would be connected by the end of the year and you've done it! will there be a video or pictures of the tamper inaction? A Very Happy New Year to all on the Cotswolds "Smiling Line". I will try to catch up with it on the day. Will the mainline and siding north of the Broadway station be fully ballasted up to the buffers? Security camera is down again. No doubt due to the high winds. Regards, Paul. The basic trackwork is in - and a surprise! 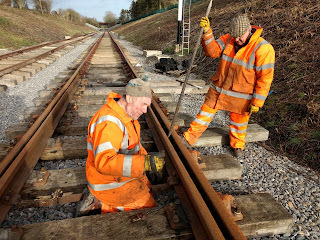 The Extension Blog is written by a GWSR volunteer, GWR Trust member and GWSR plc shareholder. The opinions expressed are entirely his own. ''To establish and maintain a railway museum for the benefit of the public''.